This must be one of my favourite vegetarian dishes. The presentation might not be very convincing but the taste is amazing. You can prepare it in a flash and it tastes even better the next day. Serve it with a bowl of basmati rice, sprinkled with toasted coconut. Yum! Put the lentils, turmeric and 6 cups water, in a large pot, over high heat. As soon as it boils, lower the heat and simmer for about 20 minutes until lentils are well cooked. If there is a lot of water left, drain lentils and put back in the pot. Heat the oil in a frying pan, over medium heat. Add the mustard and cumin seeds and cook stirring, about a minute until fragrant and slightly darker in colour (mustard seeds will turn grey). 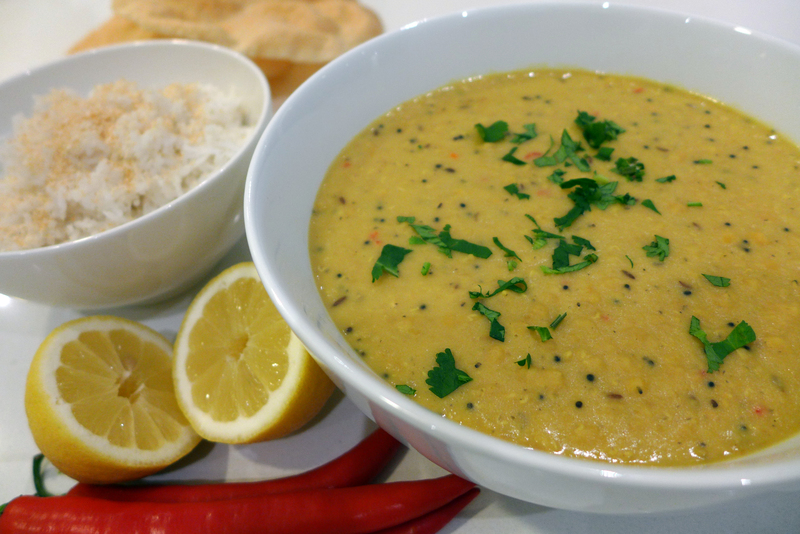 Add oil and spices to the lentils together with the chilies, coconut milk and lemon juice. Put pot over low heat, and let the curry simmer for another 2 minutes, to blend the flavors. Taste the curry and add more chilies (or chili powder) if you like it hotter. Add salt to taste. Mix in the fresh coriander and serve with rice.